Sometimes an institution crumbles so another can be born—circle of life, etc. Paperfish, the new seafood restaurant in the former Maple Drive space, opens today with aspirations of becoming that next great institution. With Patina chef Joachim Splichal ruling the kitchen (and Elite Model clients from upstairs sure to populate the bar), the odds could certainly be worse. After a moment to adjust, you'll be led past the curved central bar to your reserved booth at the rear of the bi-leveled main room. There's also a private room for up to 20, as well as a window-facing corner table with oversized chairs in the lower area—the staff is competing to give it a regal name befitting its stature. 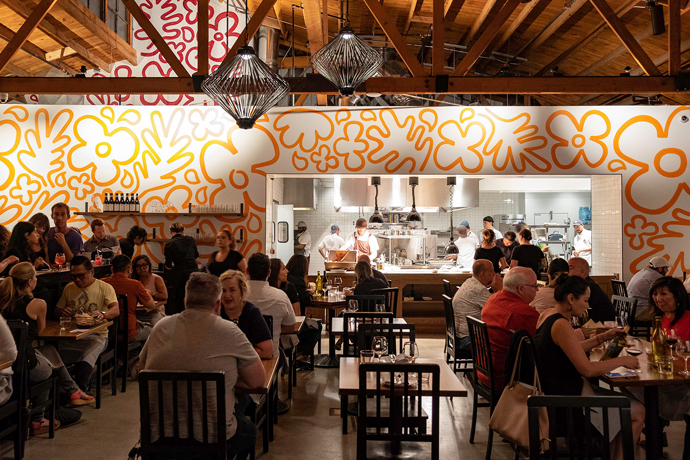 Once settled with proper prominence, you'll be faced with a modern twist on Splichal's California-French cuisine, with starters like Oysters with Pomegranate-Ginger Granité and entrees like Steamed Turbot with Dried Fruit Couscous and Eggplant-Oxtail Tagine. (And yes, lots of fish cooked in paper.) After lunch, you can hang out at the bar until 8pm, but dinner service won't kick in until January. Then the circle of life should be complete.